Although the construction of Swinton Park began in 1695, the vast majority of the building actually dates from the late 18th century. 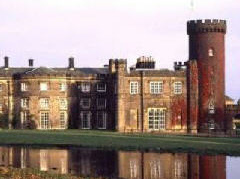 The ancestral home of the Cunliffe-Lister family, Swinton Park was visited by the Poet Laureate Robert Southey (a close friend and contemporary of the likes of Samuel Taylor Coleridge and William Wordsworth). Indeed, he would no doubt recognise much of it today, and certainly be impressed by its level of hospitality. It offers 30 guest bedrooms in total (all on either the first or second floors), and all are individually named and furnished. Five of these are suites, including one which is set over three floors in the turret (after which it is named). The property also offers numerous public rooms, including a library, sitting room, drawing room and dining room. Its restaurant, Samuel’s, is three AA Rosette, with much of the vegetables and herbs being grown on site in what is regarded as the largest hotel kitchen garden in the UK. The building is enviably situated within 200 acres of its own parkland and gardens, while those seeking pampering have the benefit of spa facilities.